IN STOCK AND READY TO SHIP. Ships to lower 48 states for $25. Front Runner Flip Pop Tent Two person ground tent. Instant set up: Just throw the tent and watch it unfold - then push in the tent stakes. Quickly folds up flat as a pancake. Store away in the heavy duty canvas carry bag with straps to sling over your back or to secure on top of or underneath your roof rack. FEATURES: Rain fly. Ventilation. Reflective guy lines. Aluminum tent stakes. Side pockets. The Flip-Pop is a quality 2 person pop-up tent that sets up in seconds. The waterproof Fly Sheet (1500mm) 60 "and breathable inner tent are all fixed to the fiberglass poles. 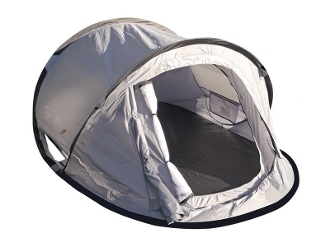 Excellent ventilation with large screened entry, breathable inner tent, 2 windows, and rear vent. Super fine insect screens will keep out the all the bugs. Comfortably fits 2 people. (2.350M) 92.5" Long x (1.43M) 56.3" Wide. 2 Mesh side pockets for wallets, keys, flashlights, phones, tooth brushes, etc. 2 overhead loops for flashlights or hanging lightweight garments. Heavy duty canvas carrying case with built in straps can be used as a back pack, or to store away for travel secured to your roof rack. Folding instructions conveniently fixed to carry bag. The sturdy 190D Oxford 3000mm floor will keep you dry. This tent is made of flame resistant fabric and meets the flammability requirements of CPAI-84. The tent, carry bag and stakes weigh only (3.4Kg) 7.5 lbs.